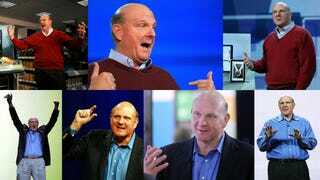 Between leaving Microsoft and buying the Clippers, poor old Steve Ballmer got a little bit down in the dumps. But to cheer himself up, he did what many of us would: he binge-watched TV. The Wall Street Journal has a wonderful feature about how Ballmer became a rookie basketball mogul. It explains how Steve was in an "atypical glum mood" for weeks after leaving Microsoft before he decided to pony up for the Clippers. To cheer himself up, he watched the entirety of the The Good Wife—around 100 episodes, or 75 hours—in just two weeks. Even when he'd decided to push forward with the purchase, though, Ballmer was still clearly a little under-confident in the strange new sector of sport. "Oprah? How do I compete with her?" he apparently asked advisers when it transpired she was also interested in buying the team. The estranged wife of Donald Sterling, the previous owner, probably didn't help when she asked "who is Steve Ballmer?"